The prestigious line of Frau furnishings have been used to create a refined and comfortable setting, ideal for conversation, work and rest. 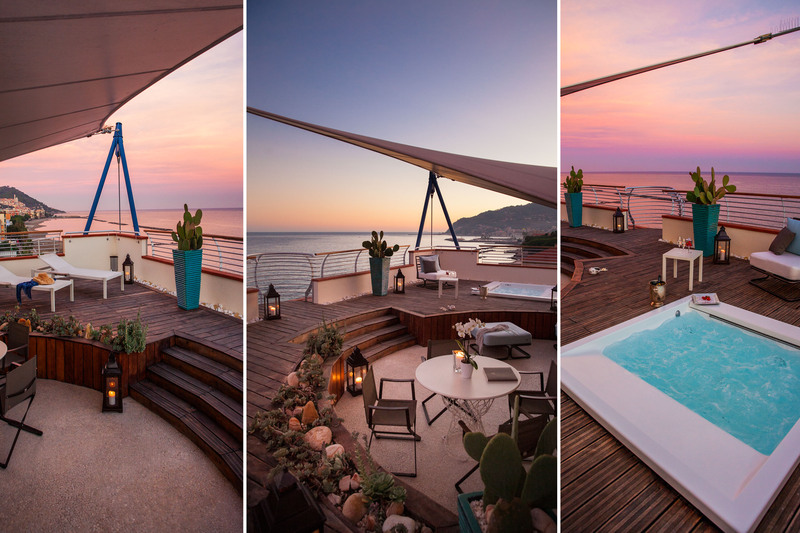 The terrace is wonderful, 80 sqm in teak for the exclusive use of the suite equipped with Teuco whirlpool model Seaside, Transatlantique beds and mattresses with a large reclining backrest. From here the view sweeps across the coast, from Cervo to Diano Marina. Suite 501 is equipped with all comforts. TV LED 40 ” in the large living room and TV LED 26 ” in the bedroom , air conditioning, minibar, code-operated safe and Wi Fi. An elegant courtesy set of toiletries adds the finishing touch to your perfect stay at Diana Majestic.